Everest launches mobile website optimized for more than just smart phones. SANTA ANA, Calif. (November 30, 2009) – Now mobile visitors to Everest’s website can access campus and course information or begin the enrollment process to become a student from virtually any web-enabled cell phone, smart phone or other mobile Internet device. 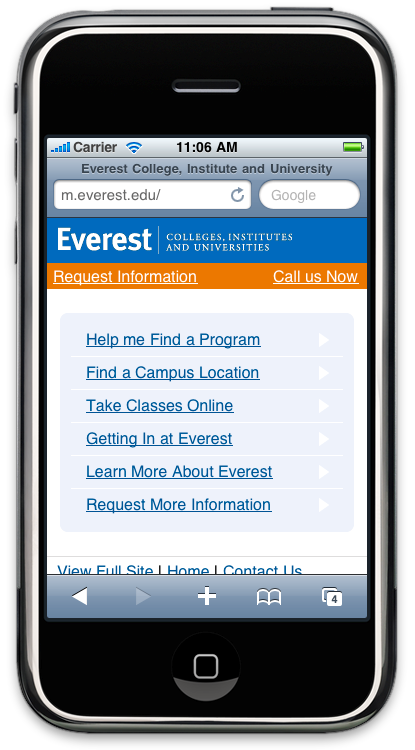 With the launch of its mobile-optimized version of the website, http://m.everest.edu/, visitors can locate a nearby campus complete with map links and directions, review career training programs, check out online classes, see financial aid options, view frequently asked questions, request more information, as well as learn about student services, student resources, accreditation information, and the admissions and enrollment processes. There’s even a “Call Us Now,” option that integrates the mobile browser with the user’s phone’s dialer, allowing for easy, safe dialing. When researching mobile website options, Everest developers felt it was important to optimize for more than just the smart phone device. They tested for a variety of mobile handsets and non-standard Internet devices in an effort to make the mobile browser experience much more user friendly and to better serve the schools’ increasing mobile traffic. “It’s all about the engaging our mobile visitors and creating a positive mobile user experience,” said O’Sullivan. Everest Universities, Colleges and Institutes and provide career-oriented diploma and degree programs in the fields of healthcare, criminal justice, skilled trades, business, paralegal and information technology. Everest is owned by Corinthian Colleges, Inc., one of the largest post-secondary education companies in North America, and has 100 schools in the U.S. and Canada. For more information about programs, visit the Everest main site or the Everest mobile site. Join the Everest conversation at Facebook, YouTube and Twitter. Press may contact Karen Kalil, AVP, Public Relations, Everest Colleges, 714-825-7789. Students can also earn online degrees through Everest University Online, a division of Everest University. For more information about our graduation rates, the median debt of students who completed the program, and other important information, please visit www.everest.edu/disclosures or www.everestonline.edu/disclosures. 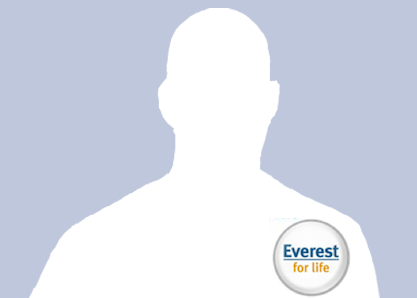 Show off your Everest Pride with a custom "Twibbon": a small graphic you can add to your Facebook and/or Twitter profile pictures.